Click here to view current Surgical Services opportunities. 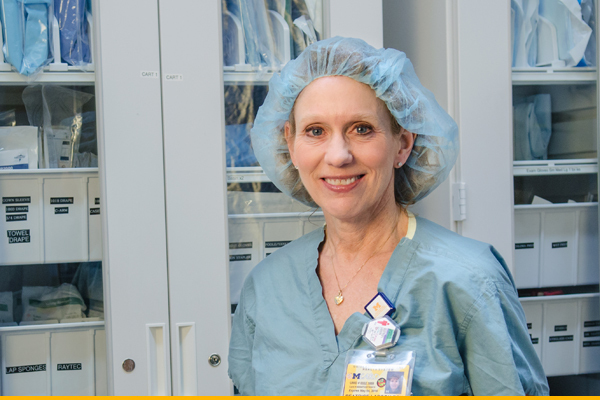 Within the Surgical Services area, nurses at the University of Michigan Health System specialize in providing quality, compassionate care to patients – before, during and after surgical procedures. Surgical Services nurses also serve as patient/family advocates and educators. Because of the diverse array of clinical environments and situations involved, the registered nurses practicing in Surgical Services are required to be proficient with a wide variety of surgical techniques, medical technology and emergency procedures. This state-of-the-art facility accommodates surgical and intensive care level procedures, with surgical nurses assisting in operations and endovascular procedures. Each of the eight operating rooms and two endovascular procedure rooms is equipped with the latest technology, much of it suspended from the ceiling on movable “booms” that can swing into place as needed. At 700 square feet, each room has enough space to accommodate today’s most advanced medical technology. In these rooms, everything from aneurysm grafting, heart-valve repair, heart bypass surgery to carotid artery procedures, heart transplants and lung operations will take place. One of the endovascular rooms has a 64-slice CT scanner, so that a high-resolution image of the heart or blood vessels can be produced right in the procedure room — saving time in urgent situations such as ruptured aneurysms. This scanner complements several CT machines, MRI machines, PET scanners, and other tools in University Hospital. After their operations or procedures, many patients will be wheeled into one of the 20 bays of the Post-Anesthesia Care Unit (PACU), where specially trained nurses carefully monitor their condition. From the PACU, most surgical patients will be admitted to the 24-bed Cardiovascular ICU, right down the hall. There, they’ll receive attentive care in specially configured private rooms that have a central column for medical gases, electric outlets and monitoring equipment – allowing nurses better access to the patient from any angle. Registered nurses who have advanced education in the administration of anesthesia, providing anesthesia and anesthesia-related care, to facilitate diagnostic, therapeutic or surgical procedures to all patients regardless of age under the medical direction of an Anesthesiologist. UMHS Certified Registered Nurse Anesthetists (CRNAs) develop the Anesthesia Care Plan together with Anesthesiologists, and prepare preoperative assessments including health histories and physical examinations. CRNAs initiate and maintain appropriate perioperative anesthesia care. Focused on serving patients seeking outpatient surgery and endoscopy procedures, the Center is staffed with U-M’s finest nurses, and patients receive the same excellent care that is offered throughout the University of Michigan Health System. The center offers four rooms for endoscopy procedures, and six fully-equipped surgery suites, totaling 49,000 square feet of state-of-the-art medical facilities. All six operating rooms are equipped for minimally invasive surgery, where arthroscopic and laparoscopic devices are employed to create smaller incisions, resulting in faster recovery. Is responsible for pre- and post-anesthesia and procedural care of pediatric (newborn – adult) patients undergoing specific procedures scheduled through Mott Anesthesiology. The PACU has a total of 76 bays which are staffed by RN’s, LPN’s, and MA’s. This staff cares for patients throughout the perioperative process. A full-service pediatric OR unit, featuring 16 operating rooms, 2 interventional radiology rooms including robotic surgery capabilities and an intraoperative MRI OR, where nurses care for children of all ages undergoing surgical procedures on an outpatient and inpatient basis. The Mott OR practices under the guidelines of the American Association of Operating Room Nurses (AORN), and is recognized by The American College of Surgeons, qualifying our OR unit as one of 13 Level I Pediatric Trauma Centers in the country. A unit consisting of 27 procedure rooms serving (primarily) adult patients requiring surgical interventions for all services, with the exception of Ophthalmology. Occasionally, non-adult clients are admitted to the unit. We believe that Operating Room Nurses have an obligation to provide the best quality care for every patient, to meet the needs of each individual as a whole, and to alleviate as much stress and trauma from the OR experience as possible for the patient and their family. In the process, we continually strive to maintain the highest level of professionalism, with a strong emphasis on nurse education and training. Within the OR Unit, a multidisciplinary team approach is the nursing care delivery system utilized; as well as a form of primary nursing. Provides care (primarily) to adult patients who have received general, regional or monitored anesthetic and pharmacologic support (MAPS). Pediatric surgical and other post-procedure adult patients may also be accommodated in the unit. Our goals within PACU are to provide patients with emotional and physical support during the perianesthesia period; anticipate potential preoperative and postoperative problems through nursing intervention; deliver intensive nursing care for optimal continuity of care; provide staff coverage with a mix of registered professional nurses and unlicensed assistive personnel for an unpredictable patient census; and provide quality-nursing care through orientation and continuing education programs. PACU Phase I is a 28-bay unit with an open room setup that provides more than one vantage point for visualizing patients. Phase I recovery of the patients occurs in the PACU. Patients are stabilized and meet discharge criteria before transfer. One isolation room has also been designated for patients, as described in the Isolation Precautions policies of the Hospital. PACU Phase II is a 9-bay unit that admits outpatients postoperatively. Outpatients are recovered and prepared for discharge from the facility, after receiving postoperative discharge instructions. Outpatient surgery follow-up includes instructions to call with questions or concerns, return appointments as requested, and a courtesy telephone call by the nursing staff. Preoperative Holding is a 17-bay unit where patients receive preoperative care. There are 17 fully monitored bays for patients requiring invasive line placement or regional anesthesia before transfer to the Operating Rooms. The new and expanded Kellogg Eye Center at the University of Michigan opened in April, 2012, as the premiere eye center in the country. We not only see adults and children for routine examinations, we also have experts who can diagnose and manage simple – and complex – vision problems that, if left untreated, can have a devastating effect on a person’s ability to see clearly. As we have since our founding in 1872, we continue to offer patients in Michigan and across the country, the latest and most effective treatments for all eye conditions and diseases. At our primary location, on Wall Street in Ann Arbor, we have a comprehensive ophthalmology clinic and seven subspecialty clinics. Most of our neighborhood clinics offer subspecialty services, as well. Please see the descriptions of the clinics in your community to find out which subspecialty experts are on staff. At Wall Street, you will also find an Optical Shop, a Low Vision Clinic, and a Contact Lens Clinic that can fit and dispense both cosmetic and therapeutic contact lenses for children and adults. Our refractive surgery service offers LASIK, and a full range of other refractive procedures. Please visit the Kellogg Eye Center website for more information about services provided at the Wall Street location.